Receding gums aren’t just a source of pain and potentially unsightly, they also could be an indication that your teeth are in jeopardy. Receding gums don't happen overnight; they may begin in our 30s or even younger. Receding gums are just what you think they are: Gumlines that are pulling back and showing more of your teeth. That’s a worry because the gum’s job is to protect the roots of your teeth, and if you’re losing your gumline, your teeth may be in jeopardy. A healthy gum is pink, moist, and adheres tightly to your teeth, so it stops bacteria and debris from gaining access to the roots. It holds your teeth in place and prevents them from shifting. Clearly, gums that continue to recede and expose an increasing amount of tooth are cause for concern. Once receding gums pass the “cosmetic” stage, where they may be unsightly, they can progress into gum disease, a.k.a. periodontal disease. Without a healthy gum to protect the tooth, you’re at risk of losing teeth. You may notice some early warning signs, like swollen gums, bleeding when brushing, or chronic bad breath. At later stages, you may experience pain and sensitivity. If you have any of these symptoms, hightail it to your dentist. 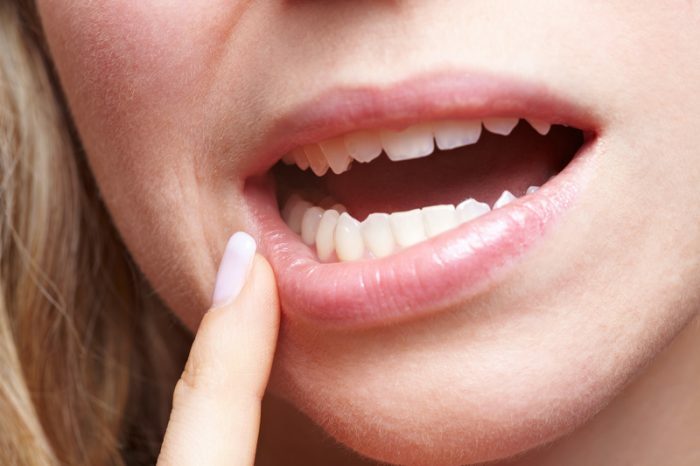 If you’re concerned about receding gums, you’re not alone. It’s one of the most common complaints from dental patients over 40. However, receding gums didn’t start overnight. Bleeding gums and sensitivity at the gumline are signs that you should take steps to slow the progression. 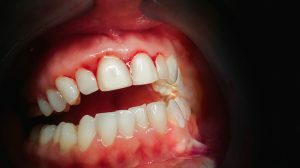 When Do Receding Gums Start? Most of us begin to experience receding gums in our teens and 20s—we just don’t know it! “Research published in the Journal of Dental Research states that almost half of 30-year-olds and almost three-quarters (70 percent) of 65-year-olds have reached the periodontitis stage,” according to The Happy Tooth dentistry in North Carolina. Periodontitis is the stage of dental disease that begins to permanently damage your gums and loosen teeth. Instead of receding gums, some people battle having a “gummy smile,” where they believe there’s too much gum showing and not enough tooth. That’s a judgment call, though, not a health risk. Poor oral hygiene is the main cause of receding gums, but you may be surprised to learn that you can overdo it in the cleanliness department. Brushing or flossing too hard is a common cause of receding gums. Always use a toothbrush labeled as “soft.” Save the “hard” and “medium” brushes for cleaning around the house—not your teeth. If you’re on top of things and notice receding gums, you may be able to halt or slow the process just by flossing regularly, brushing more gently, and paying attention to other good oral hygiene practices, like twice-a-year dental cleanings. Buy a high-quality toothbrush and, according to AskTheDentist.com, replace it every four weeks. Worn or cheap bristles can damage your gums. Choose a gentle toothpaste, such as one for sensitive teeth. Avoid harsh, gritty toothpastes. Research has proven that people with periodontal disease are at a higher risk of developing cardiovascular disease and respiratory infections such as COPD (chronic obstructive pulmonary disease). The Centers for Disease Control and Prevention (CDC) reports that 47.2 percent of adults aged 30 years and older have some form of periodontal disease. That increases to 70.1 percent at ages 65 and older. “This condition is more common in men than women (56.4 vs 38.4 percent), those living below the federal poverty level (65.4 percent), those with less than a high school education (66.9 precent), and current smokers (64.2 percent),” says the CDC. Composite restoration involving tooth-colored composite resins or porcelain that either cover the exposed root and close gaps or, if pink, can be applied to the gums to do the same thing. Deep cleaning (tooth/root scaling), which removes the plaque that has built up on teeth below the gumline. Desensitizing agents that treat nerve symptoms. Orthodontic treatments to help reposition your teeth. Removable gum veneers that replace missing gum tissue. Some people opt for a skin graft to correct receding gums. Tissue from the roof of your mouth or another area of your gum is removed and sutured to the receding gum. The periodontist may also remove a flap of the nearby gum. These procedures are usually done in the office. Complications such as infection are rare but can occur. If the graft tissue doesn’t properly adapt to the graft site, you may need a repeat of the procedure. And if you’re not happy with the appearance of the graft, talk with your periodontist about a reshaping of gum tissue—a procedure called gingivoplasty. It’s important to realize that there’s no set standard for what is too high a gumline or even what’s receding—at least in terms of how high your gum should appear on your tooth. Your ability to notice your receding gums at the earliest stage requires a familiarity of your gumline. Periodically look in that bathroom mirror and study your gumline and teeth, so you can gauge any loss. Even more important: regular checkups. Your dentist can measure the distance between the bottom of each tooth and the gumline, tracking any movement over time. In addition, if you look at the causes of receding gums, it’s obvious that flossing and brushing regularly with a soft brush are the most important ways to stop or slow receding gums. And if you’re a smoker, you can help yourself by quitting. A healthy lifestyle, regular medical care, and a nutritious diet are important not only to your overall health, but to your gum health. Finally, if you know or suspect your grind your teeth at night, discuss a mouth guard with your dentist. Dental Floss Daily: Do You, or Don’t You? bacteria, cardiovascular, cardiovascular disease, chronic obstructive pulmonary disease, copd, copd chronic obstructive pulmonary disease, dental insurance for seniors, diabetes, diet, floss, fluoride, health, healthy lifestyle, infection, obstructive pulmonary disease, pain, plaque buildup, pulmonary disease, skin, smoking, tooth pain, veneers, virus.